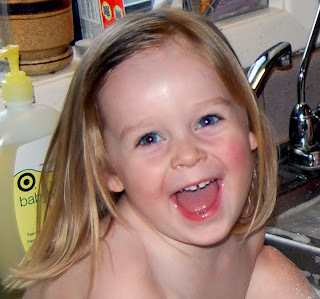 One wouldn't think bathing in a kitchen sink would bring this much joy to an almost three year old. Also, red box directly behind Claire's head= ant poison. Stellar parenting. They are each the favorite to the other. And so far, they are always thrilled with the other's presence. It is a precious time. I know it can't last. those are some big beautiful smiles! yaye sink-bathtime! You have some gorgeous kids! I just love em! Miss seeing you and hope all is going well! Wow, that girl gets cuter every day. And you know my opinion on Mr. Baby. And they look so happy, it makes me want to take a bath in a sink. there is never enough time to stare. i may have run out of cute stories.